Tomatoes offer a wide range of beauty benefits. You can add tomato in your diet or apply it topically to improve the quality of your skin and hair and not spent a fortune on a harsh skin cosmetic products. Try this wonderful natural remedy with lots of beauty enhancing properties if you want to prevent the formation of wrinkles or sun tan marks by massaging the skin with tomato pulp. If you complain about the blackheads, try to press a tomato cut in half on them and rinse off. You can use tomato pulp with honey or olive oil in case you have a dry skin. Large skin open pores is quite annoying, they make your skin look dull, rough and aged, and often trap dirt. While it isn’t possible to permanently shrink large pores you can reduce their appearance naturally with tomato juice. This natural astringent also makes your skin look brighter and younger. Although the oil on our skin is useful and protects it, keeping oily skin under control is not easy. Dermatologists agree that one the most effective way to manage the excess oil secretion is to cleanse your face every day. To be more effective and eliminate excess oil, acne, and blemishes, use tomatoes for cleansing. These dead cells cover our skin are making our skin dull and lifeless, and the best way to get rid of it, and to return natural shine and glow of the skin, is to remove the top dead layer of skin cells on a regular basis. 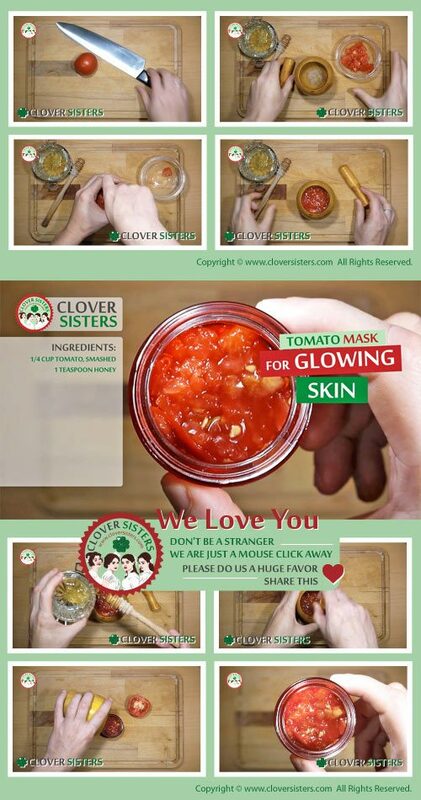 Exfoliation is the skin’s natural process and tomato is one of the best exfoliants for the skin. Mix or blend ingredients and apply on the skin for about 15 minutes, then wash it off. Results are expected almost immediately.